Holy Virgin Church is located in Carnegie just off the Parkway going in or out of the city of Pittsburgh, PA. From downtown Pittsburgh the church is just 8 miles, and from the Pittsburgh International Airport the church is about 18 miles. Take the Parkway west and exit at Carnegie. Stay in the right lane when the exit splits. This will take you on to Mansfield Blvd on which the church is located. Go through the first light and continue to the second light. Turn left at the gas station next to the church (which has three blue onion domes). There is a parking lot behind the church. Take the Carnegie exit and turn right onto Mansfield Blvd. 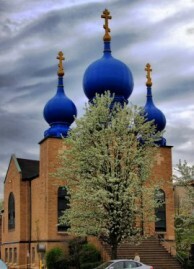 Proceed down Mansfield Blvd until you see the blue onion domes and turn right at the light. Parking is behind the church. Take the Carnegie exit and turn left. Go under the freeway and proceed down Mansfield Blvd until you see the blue onion domes. Turn right at the light. Parking is behind the church. 7:00 PM Cathedral Vigil and Confessions. 9:30 AM Service of Reconciliation (General Confession) on the first Sunday of the month except during Great Lent (9:00 AM June-August); 9:45 Hours (9:15 AM June-August); 10:00 AM Divine Liturgy (9:30 AM June-August). 7:00 PM Liturgy of the Presanctified Gifts. Confessions are heard 1/2 hour before all Liturgies and before and after Vespers. Holy Virgin Parish was organized under the leadership of Fr Peter Kockanik in 1909 and the first pastor was Fr Basil Popoff. Originally the founders of the parish were members of the Ukrainian parish of SS Peter and Paul which is located on the same block. Holy Virgin parish was established by the founders because they wanted to preserve Orthodox Faith of their ancestors. The original ethnic makeup of the parish was Russian, Carpatho-Russian, and Ukrainian. Four lots with houses were purchased and one served as a church until 1920 when the present structure was built. Over the years land was acquired for a parish cemetery, and a home in the suburbs was purchased for a new rectory. During the 70’s, under the leadership of Fr Michael Draovitch, the inside of the church was renovated with the installation of a new iconostasis and matching altar tables. Again in the mid 90’s the church and rectory were updated. The parish cemetery has a perpetual care fund and is well maintained. Also during the 90’s all the parish records were translated from Russian to English and put on computer disks by Diane Sokol and Anna Marie Sokol. Over the years, Holy Virgin parish has become a pan-Orthodox parish, welcoming people of all backgrounds. There is a full liturgical cycle of services available and all services are in the English language. The parish choir under the direction of Mr Fred Danchenko has regularly scheduled practices and they have made several recordings on tape and CD which can be purchased. The parish education system is geared for all ages beginning at age 3 and up. Sunday School starts in September and runs through May. Mrs Tamara krajnak is head of the Sunday School program and works in cooperation with the pastor and parents to meet the challenges of today’s youth. Classes are taught to the grade school children before Liturgy on Sunday mornings. Yound Adult classes grades 9-12 are taught by Fr George on the scheduled Sunday evenings. Adult Inquiry Class/Bible Study is taught by the pastor as scheduled in the Fall and Winter. The parish family of Holy Virgin Church is open, warm, and welcoming. The various parish projects from making pierogies, kobassi and the parish picnic and various dinners involve all age groups willing to lend a hand. The pastor and congregation work together to make these fund raisers successful. In the 95 years since the founding of the parish the goal of not only preserving the Orthodox Faith but living it and passing it on to future generations has and is being accomplished through the grace of God.